A recent study we conducted of over 400 sales organizations, shows sales coaching is one of the most impactful activities a manager can do to improve sales results. 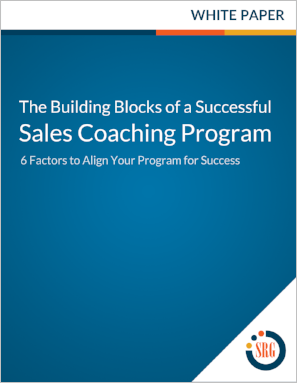 But all too often sales organizations find it challenging to develop a sales coaching program that's embedded in a coaching culture. This complimentary whitepaper covers six factors that will help you improve the return on investment of your sales coaching program. Ray Makela is an author, speaker, and business executive with 25 years of management, consulting, and sales experience. At Sales Readiness Group (SRG), Ray oversees all client engagements and the delivery of sales and sales management training programs.